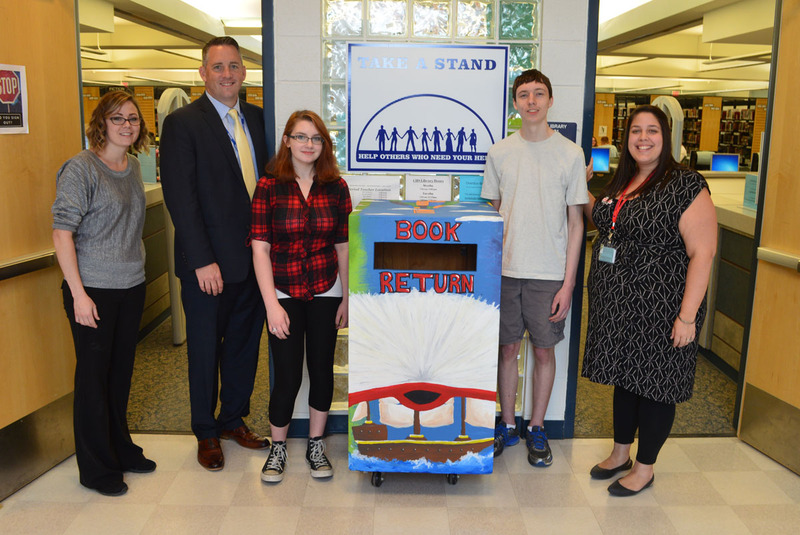 The new library drop box is unveiled by (L to R) Art Club Advisor Valerie Gordon, Principal Michael Harkin, Amber Brown ’18, Leif Haley ’19 and Librarian Kate Banks. A beautiful piece of functional artwork now greets anyone entering the Columbia High School library. The library book drop, which sits outside the library doors, was recently painted by a group of Art Club students. Amber Brown ’18 and Leif Haley ’19 took lead on the project and were assisted by Lilly Wilkes ’19 and Renee Scheck ’19. 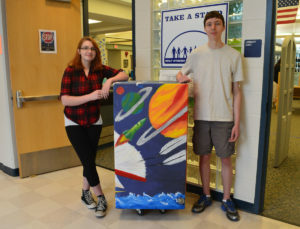 The students came up with the concept, created sketches and then painted the drop box which features a ship sailing on stormy seas, a rocket shooting towards planets in outer space and castles made to look like books on a shelf.